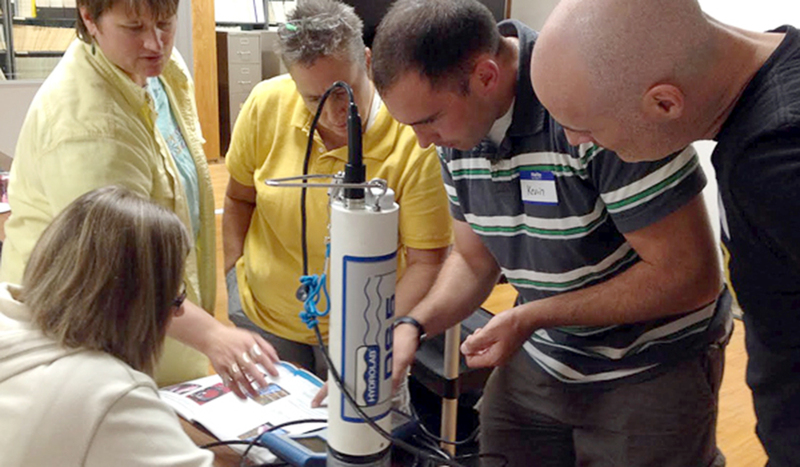 Educators receive training on a Hydrolab DS5 water quality sonde via the Limno Loan program. This story first appeared on LakeScientist.com. The Limno Loan program, overseen by the Illinois-Indiana Sea Grant, is making it easier for educators around the Great Lakes to teach their students about freshwater science. Not only that, but it’s also inspiring youngsters who have never gotten to use real scientific gear. The program, which launched in the 2011-2012 school year, began after suggestions from teachers taking part in a science workshop on the Lake Guardian Research Vessel. The workshop on the U.S. Environmental Protection Agency ship led them to think that it’d be a great idea to get some of the same gear into the hands of their students. The Limno Loan program of today is pushing the boundaries of success, providing four Hydrolab DS5 water quality sondes to high school and middle school teachers around the Great Lakes. Each gets the sondes for about two weeks, including shipping time to and from the Sea Grant, to use in their lesson plans. That first year, the program only had about five teachers who checked out sondes. This year, more than 20 have already signed up and the pace signals to program managers that nearly 40 could use them by the end of the school year. When that’s the case, it’s common that the educator secures some sort of grant to cover the cost. And there are usually educational discounts that can help. Loaning the sondes out to teachers provides a substantial cost savings over purchasing. Each one records a standard set of parameters, including temperature, conductivity, pH, dissolved oxygen, chlorophyll a, turbidity and depth. The measurements are incredibly intriguing to students, who can see how their local water body is doing in real time. But since most of the sampling trips hit ponds on campus or streams nearby, depth is not as important as the other data coming in. TePas points out that the sondes have a lot of advantages over other methods the kids may have used in the past. Water quality testing kits often use tablets or strips that can introduce complexity. And the projects sometimes take longer because of that. One big advantage that the Limno Loan program provides to school kids is that they actually get to use real scientific gear. The teachers benefit as well. Long before students get their hands on the sondes, Sea Grant officials give them hands-on training to use the gear. The training is provided during workshops, TePas says, typically during other activities in partnership with local groups. Because of that, they can take various formats, but the training is consistent throughout. TePas says it usually starts with the parameters, covering what they measure and what their levels mean when it comes to aquatic health. A few suggestions for activities or coursework that the teachers could use are also thrown in. The busy season for the Limno Loan program typically coincides with the school year, it seems. Most of the sondes get checked out in September and October during the fall. When winter comes, TePas and others can’t send them out because of the risk of frost damaging the sondes and their sensors. But things pick back up with educators once again borrowing them in April, May and June. With those restrictions, it’s not likely that the sonde-sharing program could get any bigger than it is currently. The equipment also gets used by Sea Grant educators when not in use by teachers. But it’s certain that the program is providing benefits for teachers and students in the Great Lakes. In just the few years it’s been running, TePas says the sondes have gone from schools in New York to Minnesota and everywhere in between. Daniel covers monitoring, tech and everything in between as editor of the Environmental Monitor. You can also find his work on Lake Scientist. Connect with him on Twitter @danielrkelly.